Todd Peck picked up the 3rd last-place finish of his NASCAR Camping World Truck Series career in Saturday’s Las Vegas 350 at the Las Vegas Motor Speedway when his #63 Sahlen’s / Fr8Auctions.com Chevrolet failed to complete any of the race’s 146 laps. The finish, which came in Peck’s 30th series start, was his third of the season and his first since Charlotte, thirteen races ago. 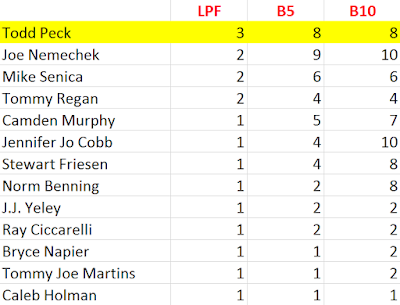 With five races to go, Peck retakes the LASTCAR Truck Series Championship lead, having broken a tie with Joe Nemechek, Mike Senica, and Tommy Regan. Las Vegas was Peck’s sixth Truck Series start since the last-place run at Charlotte, and his second in that span where he drove the #63 Chevrolet. This season has seen the #63 entered by both Mike Mittler, who has fielded the number for all of the team’s attempts since Tony Roper lost his life at Texas in 2000, and D.J. Copp, who has started his own team this year with Peck making a number of starts in the team’s #83. 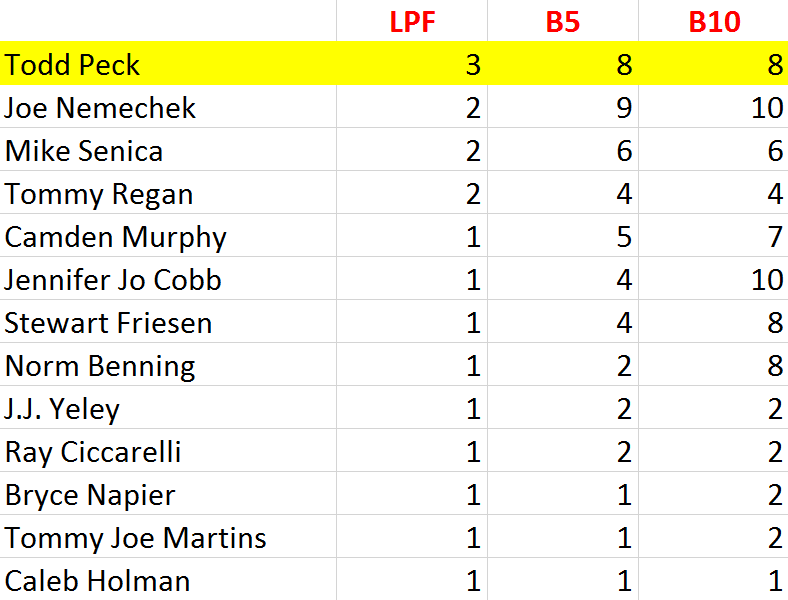 Peck’s best runs in 2017 were both in Copp’s #83, an 18th at Daytona and 19th at Pocono – the only two races Peck has finished under power this season. 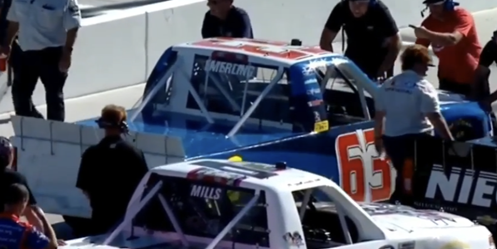 Similar to the XFINITY Series race held that day on the other side of the country, the Truck Series field at Las Vegas grew by one at the last moment. With stuntman-turned-rally champion Travis Pastrana making a one-off start in Al Niece’s #45 Chevrolet, Niece entered a second truck for the first time since Iowa in June. Enlisted to drive was Niece’s full-time driver, T.J. Bell. Bell managed a lap of 166.636mph, 11mph slower than polesitter Ryan Truex. The next four drivers ran slower still. The slowest of all completed was Mike Senica’s 136.626mph – his Norm Benning-owned #57 Chevrolet more than nine full seconds, or 31mph, off the pole speed. But Peck still started last, unable to complete a timed lap because of engine issues. His truck was Patrick Emerling’s #83 from Loudon with white untrimmed “63” decals hastily added to the doors and roof, Emerling’s name still in the rear window. The truck’s only lap of the weekend came in Saturday’s final practice, where he anchored the charts with a single circuit of 150.581mph, or 35.861 seconds. The session’s leader, Kaz Grala, ran even faster than Ryan Truex did in qualifying, with a speed of 179.045mph, five-and-a-half seconds, or 29mph faster than Peck. Peck’s motor problems continued into the race itself. When the engines fired, the #63 wouldn’t turn over, and the crew pushed the truck to the garage, done for the night. Seconds later, a tight battle for the lead sent rookie Myatt Snider into a spin down the backstretch, destroying Kyle Busch’s #51 Louisiana Hot Sauce Toyota. Both Peck and Snider did not complete a lap, bringing the field back down to 27 trucks. FS1’s leaderboard didn’t list Peck officially “out” of the race until with 19 laps to go in Stage 1. 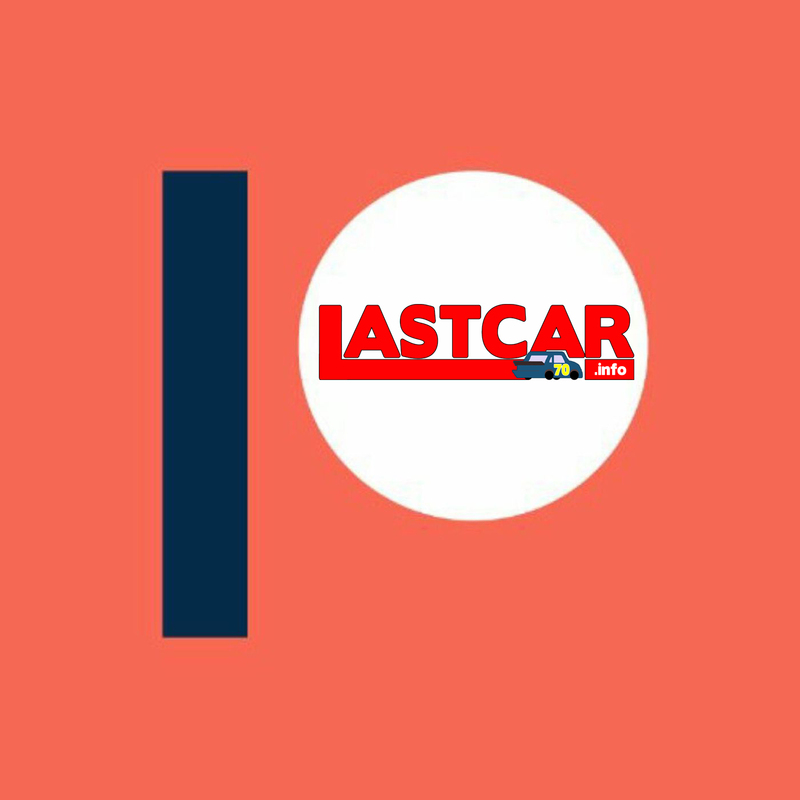 The rest of the Bottom Five was filled by Peck’s fellow LASTCAR contenders. Mike Senica ended up 27th, his #57 Norm Benning Racing Chevrolet pulling off the track under the Snider caution with transmission issues. Joe Nemechek stopped shortly after the restart with electrical issues on the #87 D.A.B. Constructors Chevrolet, followed two circuits after by Matt Mills in his first Truck start since Pocono, back in the #0 Driven2Honor.org Chevrolet in place of Tommy Regan. 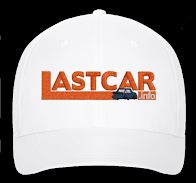 *This was the first last-place finish for the #63 in a Truck Series race at Las Vegas since October 13, 2002, when Carl Edwards was driving for Mike Mittler. Edwards’ #63 Mittler Brothers Machine & Tool Ford exited the Las Vegas 350 after 1 lap with engine trouble. 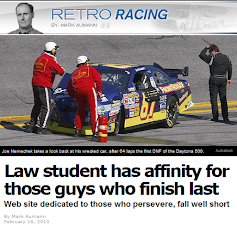 *This marked the first time in history of all three of NASCAR’s top series that four consecutive races saw the last-place finisher fail to complete any laps. Prior to Saturday, the three-race streak through New Hampshire was matched only twice, both times during the 1964 NASCAR Grand National season. 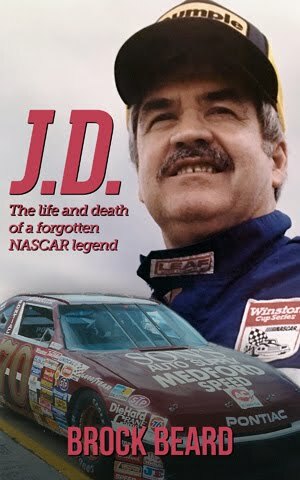 The first occurred from April 16-26 with Cale Yarborough at Columbia, Fireball Roberts at North Wilkesboro, and Billy Wade at Martinsville. The other occurred from June 11-19: Buck Baker at Concord, Ned Jarrett at Nashville, and Cale Yarborough at Boyd Speedway in Chattanooga, Tennessee.